After childhood favourite Postman Pat got a digital makeover, it’s your turn to make your post digital. 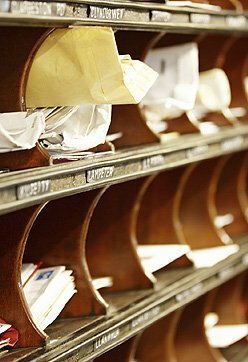 Banish the clutter of postal documents with a digital mailroom. You can have all of your existing hard copy post scanned onto the mailroom to be found and accessed at the click of a button. You can improve your mailroom management with a virtual mailroom that can create automated accounts payable documents as well as invoice processing. Here at Pearl Scan, we offer a simple but efficient solution to digitise you mailroom. STEP 1- We can collect your post every morning (Mon-Fri, excluding bank holidays) from your office, local sorting office or from a prearranged PO BOX address set up securely and specifically for you. STEP 2- Once we have the post at our secure premises, it will then be opened and sorted by our experienced team. STEP 3- All fasteners will be removed from the documents to prepare them for scanning. STEP 4- The documents will be scanned at 300 DPI in black and white or colour as to your preferences. We have the facilities to scan a huge range of sizes from cheques and receipts to large format drawings in size A2-A0. STEP 5- Once scanned, the documents can be indexed by a prearranged criteria making them easy to find through simple searches. STEP 6- Through OCR (Optical Character Recognition) processing, your documents can be found through searches including their contents. STEP 7- To provide you with your digitised documents, we can convert them into a range of formats to suit your needs such as PDF, PDF Searchable and TIFF. STEP 8- Once you have digitised copies of your mail, we can either return your hardcopies to your office or place them into our deep storage system so you can save important office space. With the popularity of email within the office, post, in the enveloped and stamped form, is being left behind. We no longer write letters to each other on a daily basis. Long lost friends catch up through email and competitions are ‘enter online’ now, making that old phrase ‘answers on a postcard’ fairly redundant. If you conduct most of your business through emails then you should set up a digital mailroom to get that remainder of hard copy correspondence into the same format as everything else. If you would like some more information on the virtual mailroom services we offer in Manchester, Birmingham, London and across the UK, or if you would like to request a quote, get in touch today.